Let’s face it. 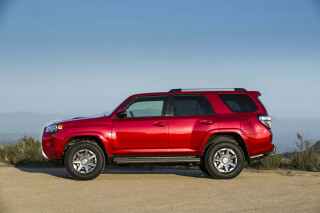 Full-size SUVs aren’t nearly as popular as they were just a few years ago. 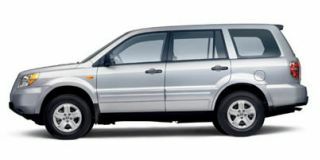 According to Ford’s own market analyst, George Pipas, the full-size SUV market doubled from 500,000 in 1996, the year that the Expedition was introduced, to a million in 2001, where it stayed through 2003. Then, from 2004 to 2005, the segment plunged about 20 percent, to 800,000, and from 2005 to 2006, sales look to be down by about another 20 percent. Pipas estimated, perhaps optimistically, that the market for full-size SUVs will stabilize around 650,000 per year. So if a million people were recently buying vehicles like the Expedition each year, and now it’s suddenly more like 650,000, who are those 350,000 who decided they didn’t need a full-size SUV? Well, people who didn’t really need a vehicle like the Expedition for heavy towing, and hauling full loads of people and cargo around. 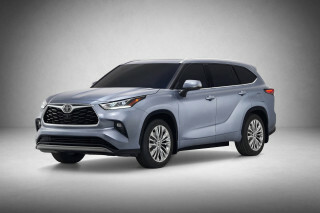 Those people who didn’t need the Expeditions size and heft are moving on, back into cars or more likely into car-based crossover SUVs that get better fuel economy and are easier to park. And, probably, nothing but the sustained return of cheap gas is going to change their mind. With that in mind, for this latest F-150-inspired redesign of the Expedition, Ford is zeroing in those “core SUV customers” who really need a full-size SUV, and hoping to sway some shoppers away from GM’s new full-size SUV buyers in the process. 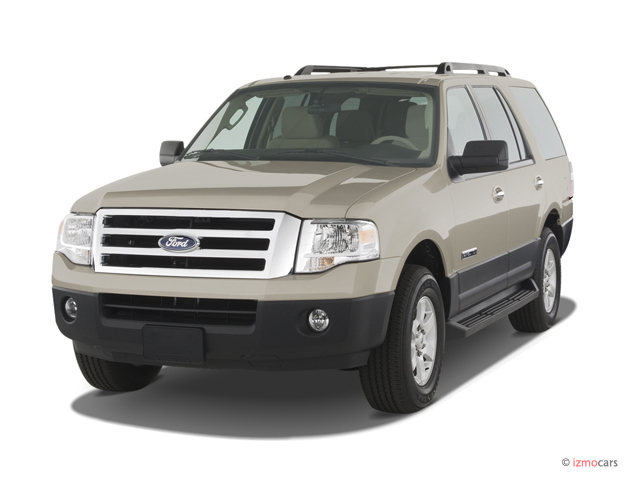 Ford found, through market research, that 92 percent of Expedition buyers used their vehicles for vacations, 60 percent used them for carrying outdoor equipment, and 84 percent frequently used them to carry passengers behind the first row (80 percent of those are frequently carrying three or more behind the back seat). Since Expedition owners so often use the back seats, rear seating and driving dynamics were a top priority in the vehicle’s redesign. The interior, with seating for nine, has been fully redesigned. The second- and third-row seats now fold completely flat; the second row has been recontoured, while the third-row seats now offer a foot more legroom than those in the Chevy Tahoe and Suburban. Most notably, there’s a new plus-sized EL model this year. 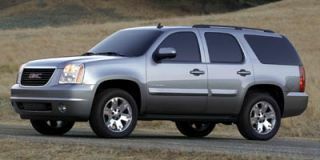 Filling some of the void left by the discontinuation of the mammoth Excursion — and competing head-on with the Chevy Suburban and GMC Yukon XL — the EL adds about 15 inches of length, allowing an extra 24 cubic feet of storage space. With the wheelbase stretched by about 12 inches, the EL is unique from the B-pillar back, including different, more upright rear doors that allow easier entry and exit to the third row, plus different running boards, roof rack, and trim than the regular Expedition. All sorts of measures have been taken to assure a quieter interior. A new “quiet steel” material is used throughout the dash panel, and increased sound-deadening material is used in the carpet and headliner, plus thicker side glass and a new acoustic windshield. Also, mounts for the engine, transmission, and body have been improved to help isolate vibration. The Expedition keeps its body-on-frame construction, but has a unique independent rear suspension that helps improve ride and handling, and distinguishes it from most other large SUVs. Now for the new 2007 model, Ford moves to a revised design that has some of the same ride advantages along with more handling precision, especially under a full load. The new design is a five-link arrangement, as opposed to the previous double-wishbone design, allowing both more lateral body control and what chassis engineers described as “longitudinal compliance” — an attribute that brings a more secure feel to the handling over choppy pavement surfaces. The front suspension has also been redesigned for the new modular front subframe, though the symmetry remains the same. That modular front subframe is part of several significant changes made in the Expedition’s crash structure to accommodate collisions with much lower passenger cars. The contact points have been revised, and the subframe has been redesigned to crush more easily, absorb energy more uniformly, and be more easily replaceable in collision repair. AdvanceTrac with Roll Stability Control (RSC), which can apply one or more brakes individually to restore vehicle stability, is standard on all Expeditions. Seat-mounted side airbags are optional, but a Safety Canopy rollover detection system and side-curtain airbag system that covers outboard occupants for all three rows of seating is standard. The steering column has also been redesigned to be energy-absorbent; it can compress up to four inches in a frontal impact. Those who really need an SUV like this often need to tow. The Expedition can now tow up to 9200 pounds — 300 pounds more than the 2006 model. 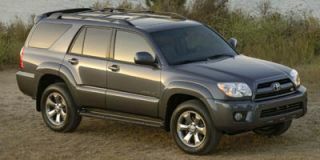 A load-leveling suspension, similar to what’s been offered for several years on the Expedition, will be optional, and is recommended for those who tow regularly. A diesel option is still on the wishlist, but Ford officials said it isn’t likely anytime soon. 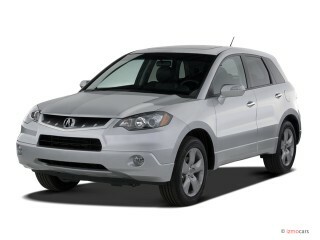 Which brings us to powertrains. For now, the only powertrain offered on the Expedition is essentially carryover from the ’06: a 5.4-liter V-8 with three valves per cylinder and variable valve timing, making a respectable 300 horsepower and 365 lb-ft of torque. Even though the new Expedition weighs slightly more (due to increased safety and convenience equipment) it performs better in the new vehicle, thanks to a new six-speed automatic transmission. 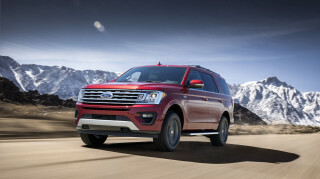 Ford confirms improved performance over the old four-speed, and says that the Expedition is now actually faster off the line than the Chevy Tahoe, while fuel economy is up to seven percent better on the highway than the ’06. On the road, the Expedition is much improved. While it was impossible to forget that we were piloting a vehicle that’s over 6000 pounds (in the case of our 4x4 EL test vehicle) and more than 18 feet long, it certainly doesn’t “ride like a truck,” and though we won’t say it was a joy to hustle along a section of twisty road, we were amazed by how easy it was to drive on the curvy stretches, even when the road surface became rough. The suspension does a splendid job of soaking up irregularities while keeping the back wheels glued to the road over rough surfaces, with none of the nervous hopping that characterizes solid-axle designs. A new engine-speed-variable power boost system for the steering allows 15 percent more boost at low speeds while giving a firmer feel at higher speeds. You still don’t have a great feel of the road, but it does feel much more confident at speed, and lane placement is easier. Stopping power has been upgraded as well, with larger brake calipers and rotors and a welcomed firmer pedal feel, thanks to a new master-cylinder setup. Ford hasn’t yet released EPA fuel economy estimated for the Expedition, but according to the trip computer on our test vehicle, an EL, we saw an average of just under 14 miles per gallon over lightly traveled country two-laners and some brief urban highways and streets. Last year’s Expedition was rated 14 city, 18 highway, and Ford officials said that with the new transmission the highway rating of the 2WD standard-length model may climb to 20. But we should come back to the interior, as it’s where the Expedition has been most dramatically improved. Materials and controls have been completely revised, and the difference from last year’s model is like night and day. Gone are the generic black plastic buttons and fascias, replaced by a more luxurious-feeling layout. Comfy front captain’s chairs are standard on all models (with 20 mm more travel this year), and thanks to a wide range of adjustability in the steering wheel and pedals, folks of widely varying sizes should have no problem. At 6’6”, I found the second row quite commodious as well, and I would have no problem sitting in the third row for short trips. And although entry was a bit difficult in the standard Expedition, it was much easier in the EL thanks to the wider doors. The Expedition lineup has been simplified to three models — XLT, Eddie Bauer, and Limited — while, compared to equivalent 2006 models, there’s more standard equipment and prices have been lowered an average of $4300. The XLT starts at only $29,995, including destination. And, due largely to the cut in sticker prices, 36-month residual values will see a boost of up to nine percent — good news whether you plan to buy or lease. The base XLT model, according to Ford, “defines tough luxury,” while Eddie Bauer and Limited models pile on more convenience features. 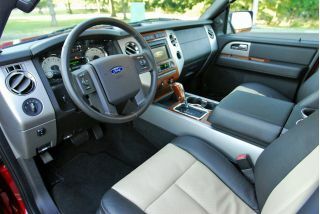 Six-way power seats are standard on the XLT, while ten-way seats are offered on all models with leather trim. From those you can step up to the heated and cooled leather-trimmed front seats. The second-row seats can be optioned 40/20/40-split, with a forward-sliding Centerslide section to allow better access to a child seat, for example. A PowerFold third-row seat is optional, allowing it to fold flat with the touch of a button, while a new, redesigned power liftgate is also available. Ford has moved the mechanism away from the ceiling, eliminating the hump that could obscure the driver’s vision while backing up. A new-generation, DVD-based navigation system is the centerpiece to bring the Expedition’s instrument panel up-to-date, with a 6.5-inch touch screen, voice-activation features, and street-name announcements. 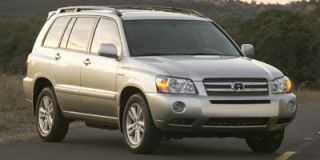 Sound systems option up to a 340-watt, MP3-capable system with six-disc CD changer, iPod plug-and-play capability, and available Sirius satellite radio. There’s also a rear DVD entertainment system with big eight-inch screens and infrared headphones. Ford’s expanded warranty now includes bumper-to-bumper coverage for three years or 36,000 miles, and five years or 60,000 miles of powertrain coverage and roadside assistance. 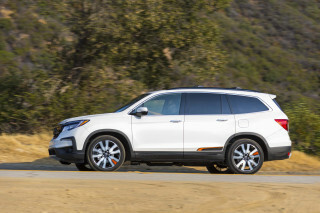 With gas prices rising even higher this summer, GM and Ford are in a heated battle for the remaining full-size SUV buyers. GM still has about 62 percent of the full-size SUV market, but Ford stands to gain some share with this new Expedition when the first deliveries begin this month. 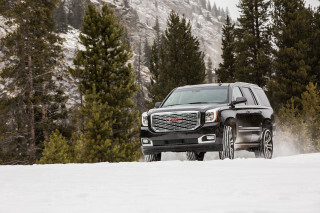 It doesn’t have the power to match what’s available in the new GM utes, but in terms of the interior, features, and value, it gives GM’s SUVs a run for the money.